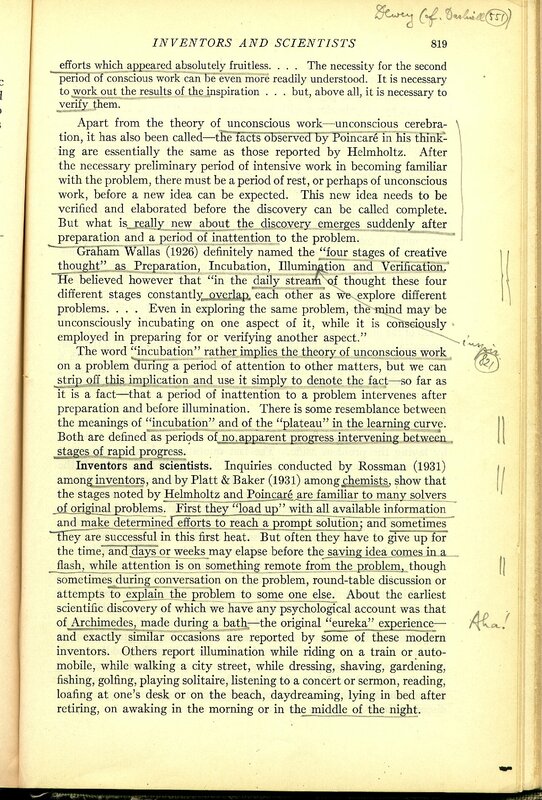 Click for images of selected pages. 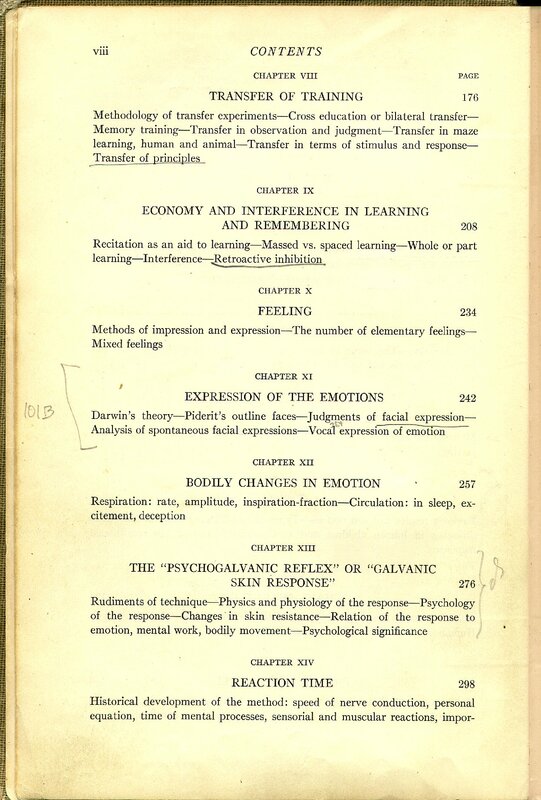 Paul Chase was at one time a graduate student in the Psychology Department at UC-Berkeley. 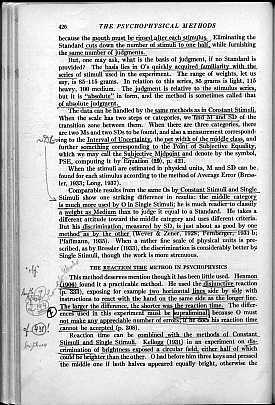 He was also a book lover and collector. 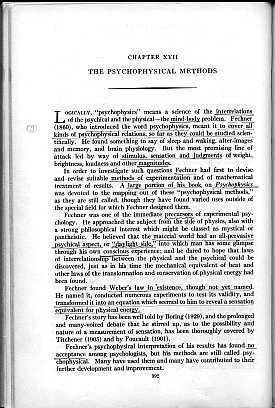 When he decided to leave psychology for computing, he decided that he needed to find some of his books good homes elsewhere. 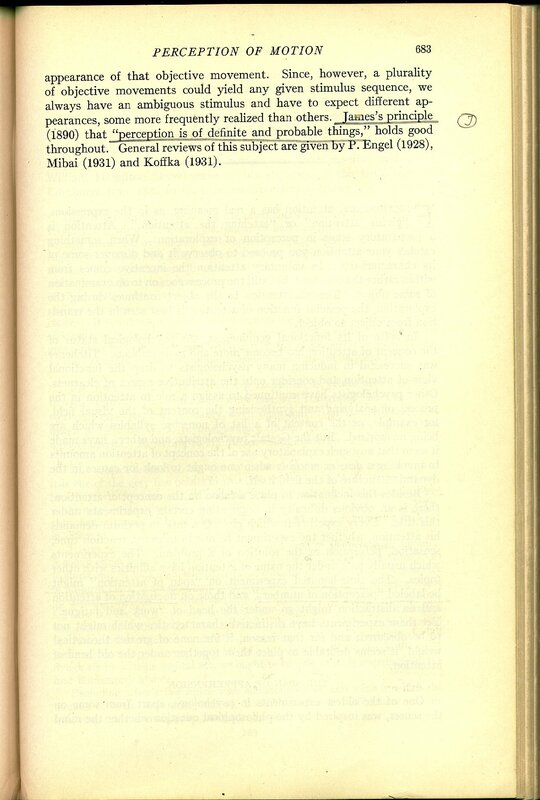 I helped him sell them. 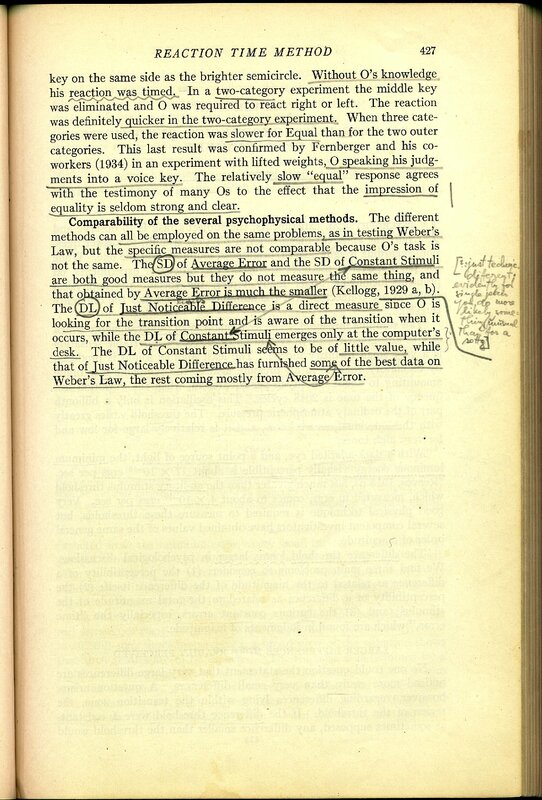 My recollection is that I brokered a sale of Woodworth between Paul and Ken. 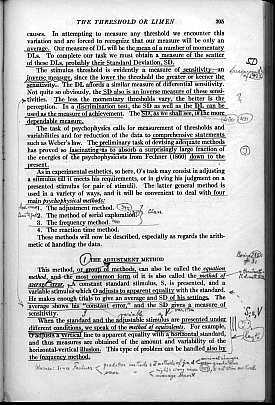 I think Ken paid $10 ;-). 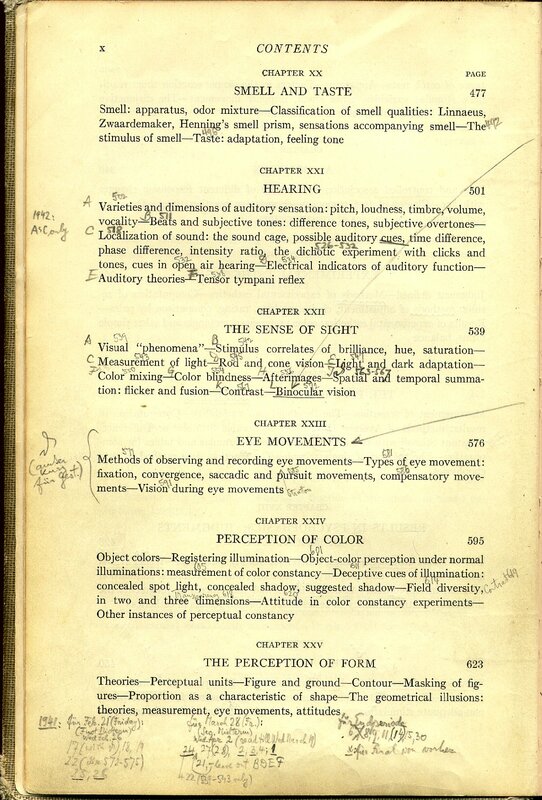 I don't know where Paul found the book. 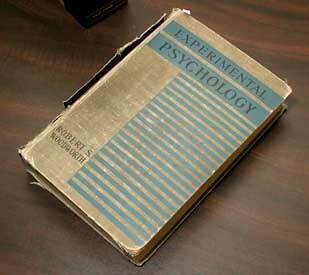 He may have found it at a second-hand store -- there are lots of these in Berkeley -- or he may have found it discarded in the Psychology Department at UC-Berkeley. 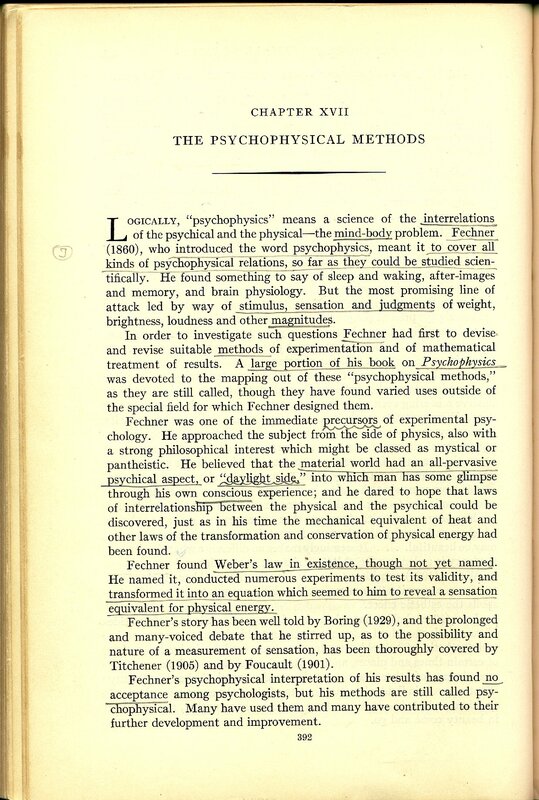 I think that there was a small library or reading room in the Psychology Department that was remodeled or repainted and that some old books were discarded at that time, so that is another possibility. 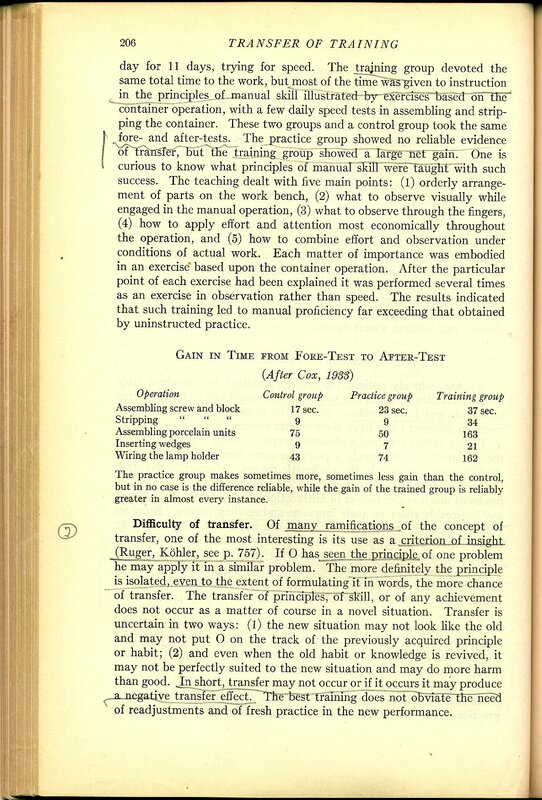 Ken Hammond gave the book to the Brunswik Society, and, for several years, it was given to the winner of the New Investigator Award at each annual meeting. 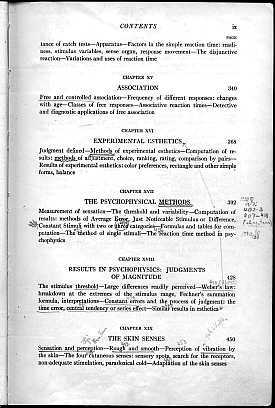 The winner was to have custody of the book for a year and then bring it to the next meeting to be given to the following year's winner. 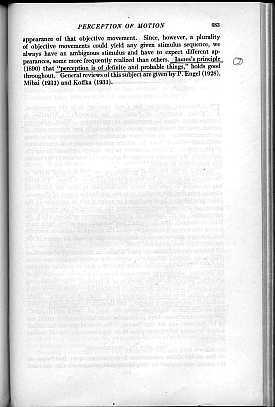 In 1996 it was given to Elke Kurz, who was at Bowling Green University at that time. 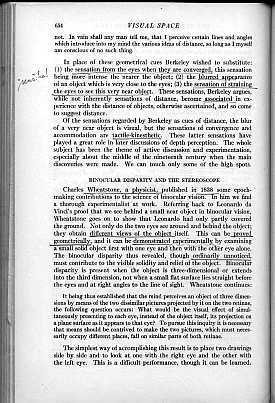 Ryan Tweney, who is an expert in rare books, recognized the value of the book and was concerned that it might deteriorate further. 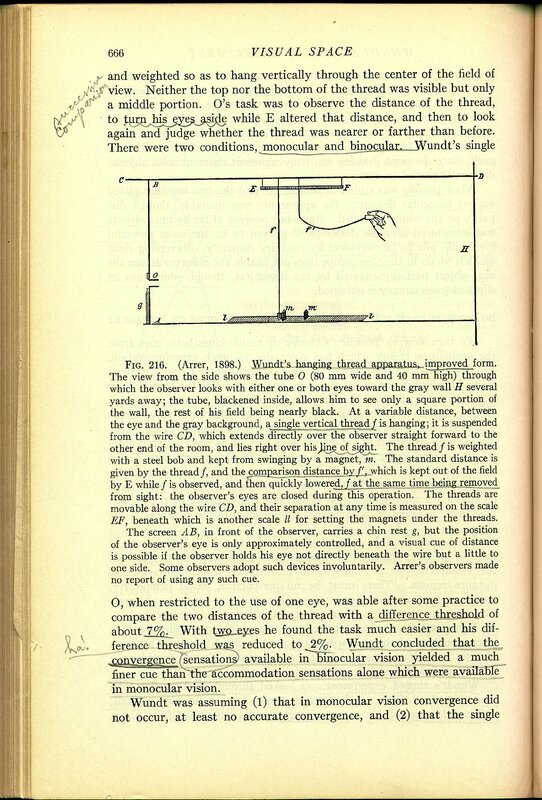 He had a beautiful archival box made to protect the book and kindly donated it to the Society. 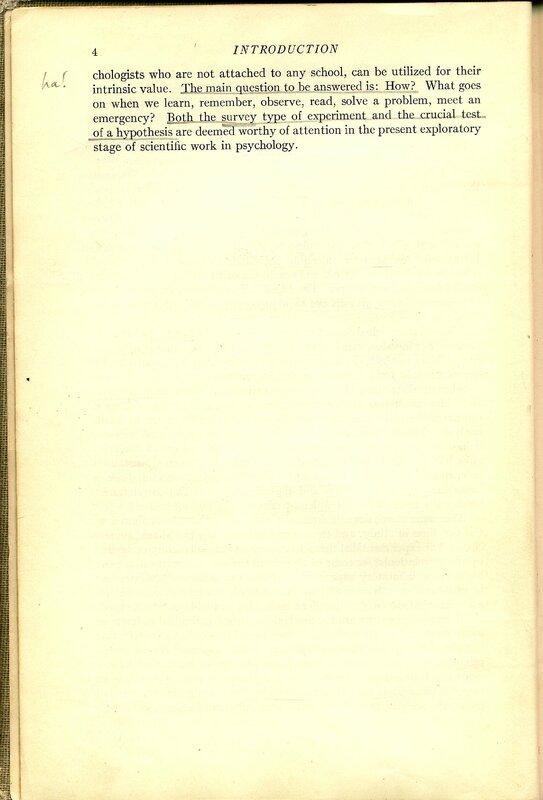 The book is no longer circulated and is kept in the box to be exhibited at annual meetings. 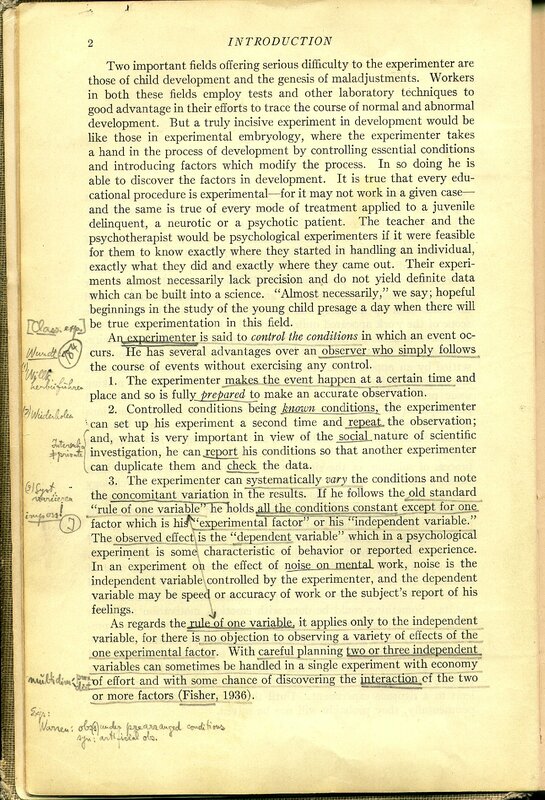 Soon it will find a permanent home in the Archives of the History of American Psychology at The University of Akron. 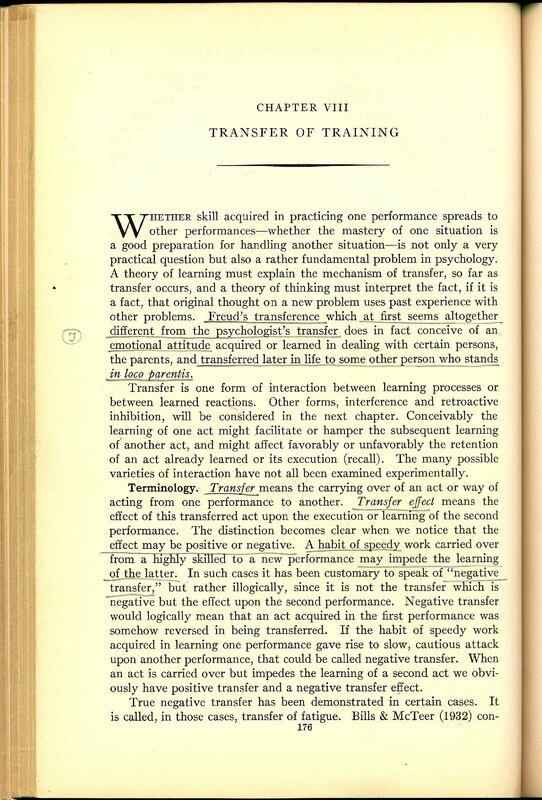 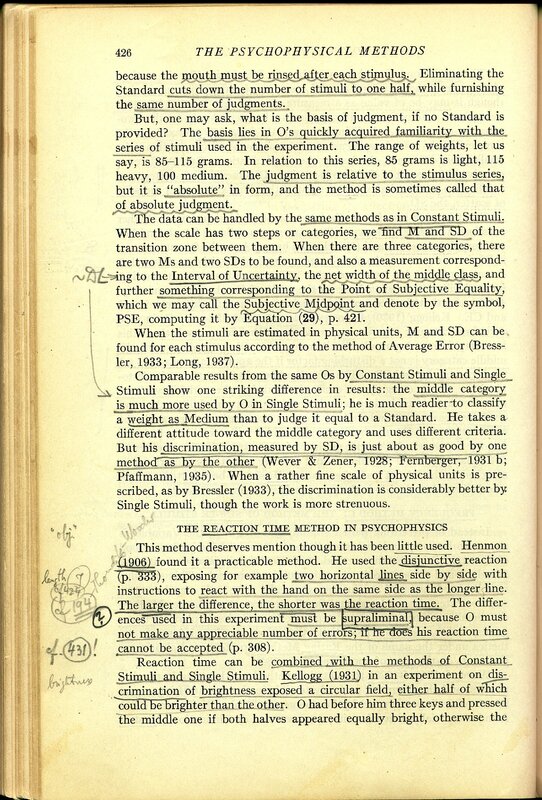 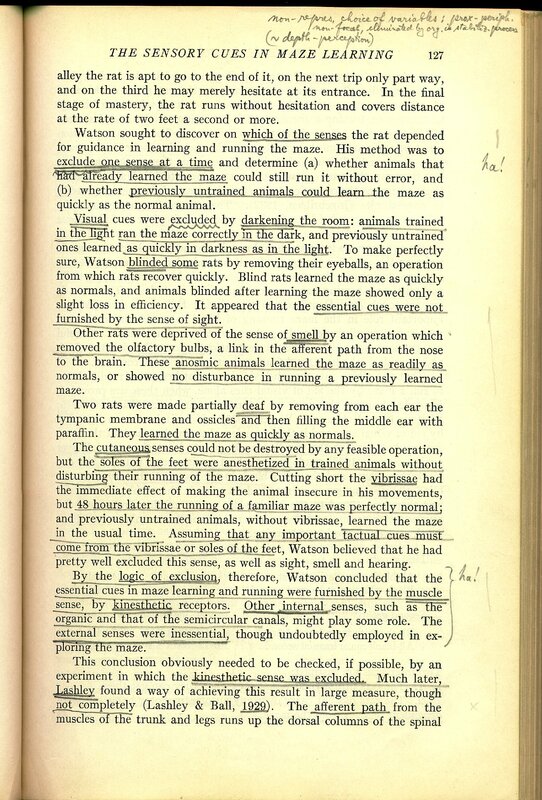 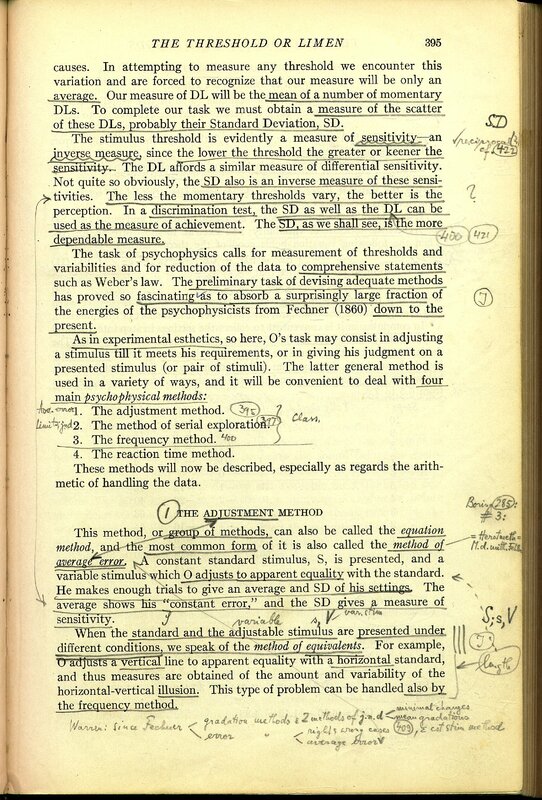 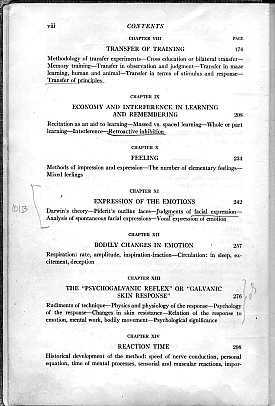 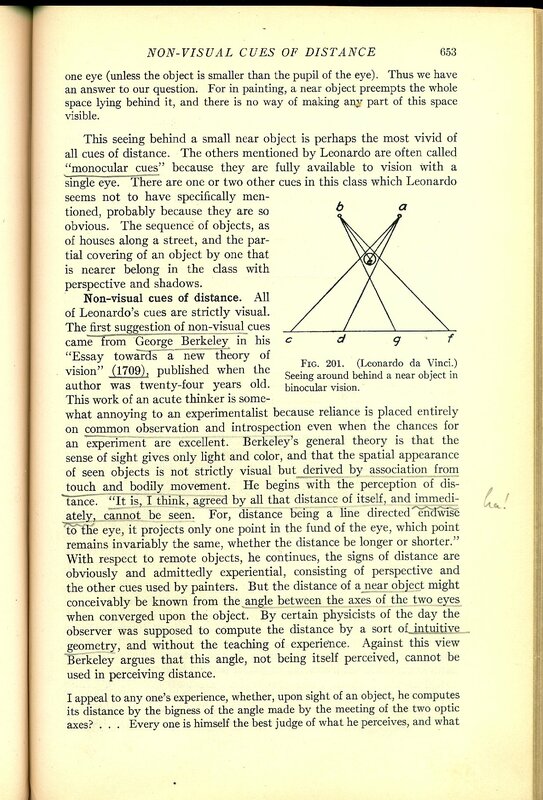 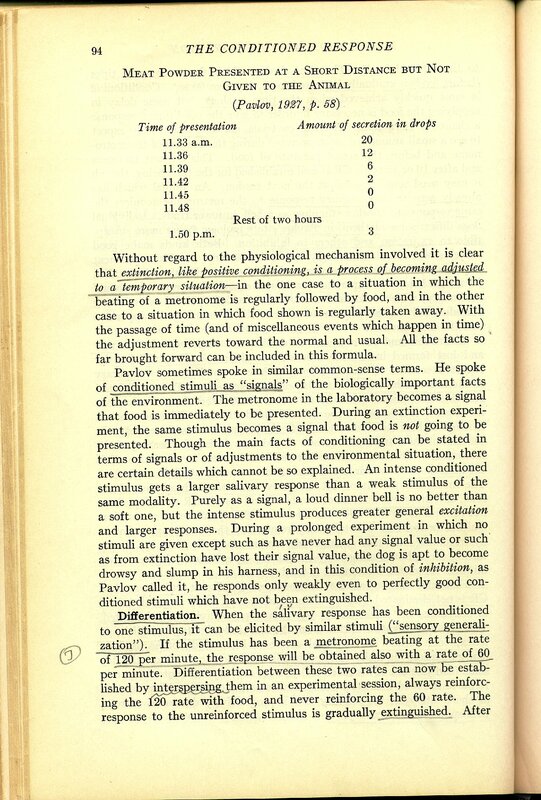 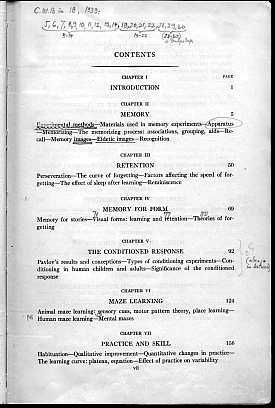 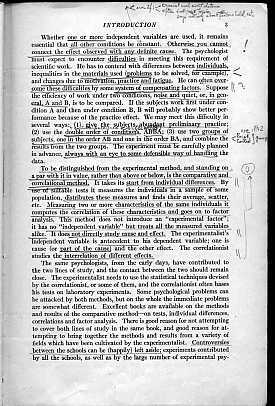 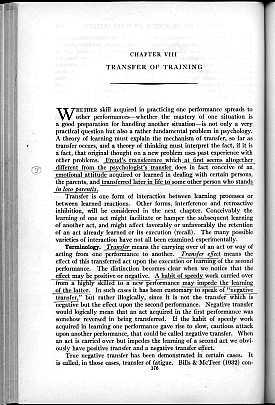 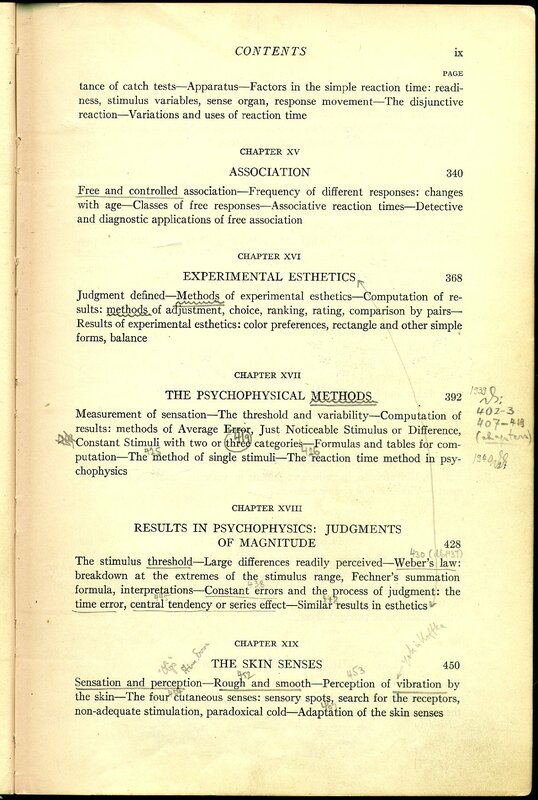 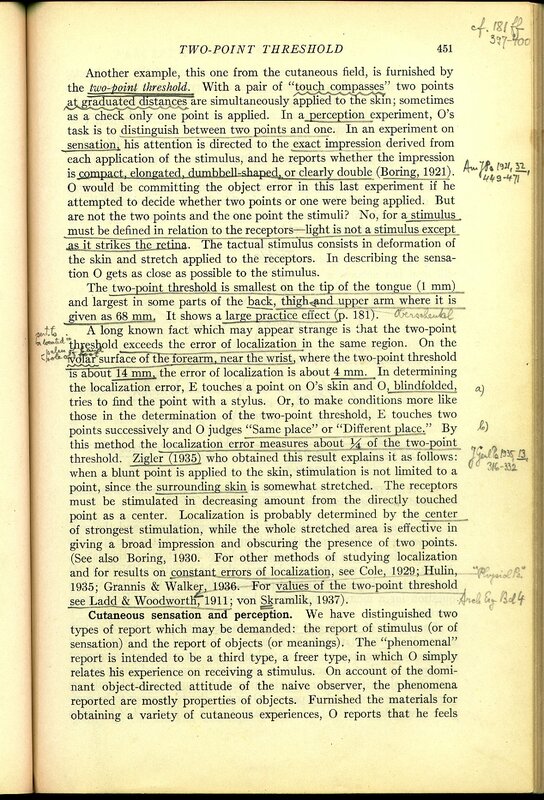 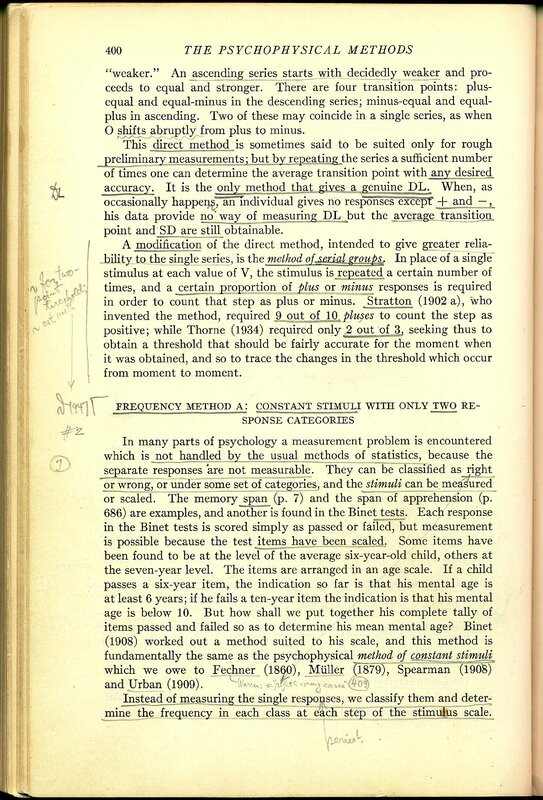 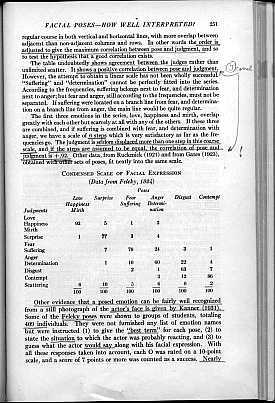 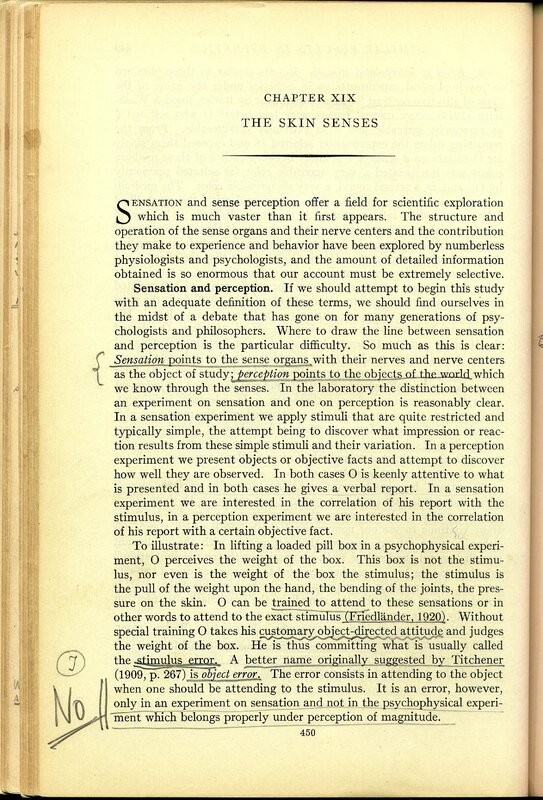 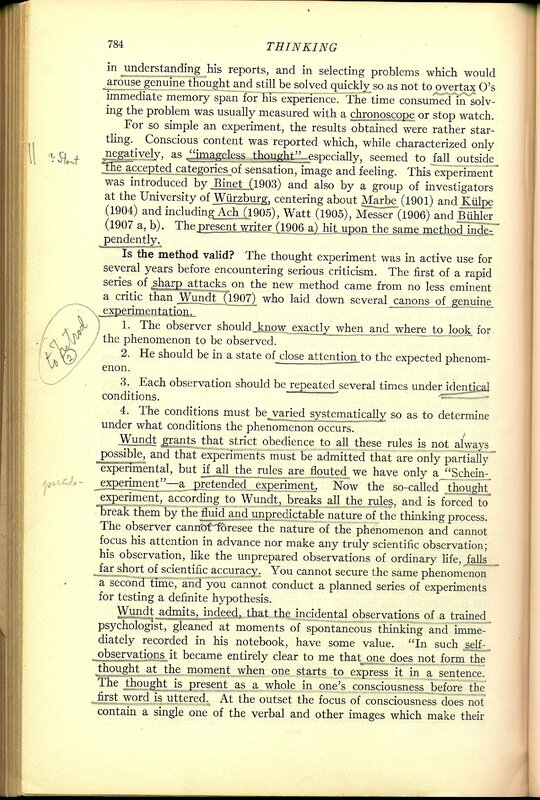 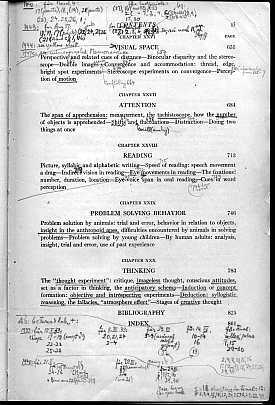 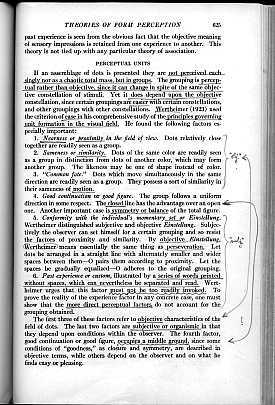 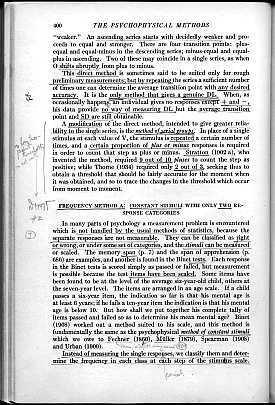 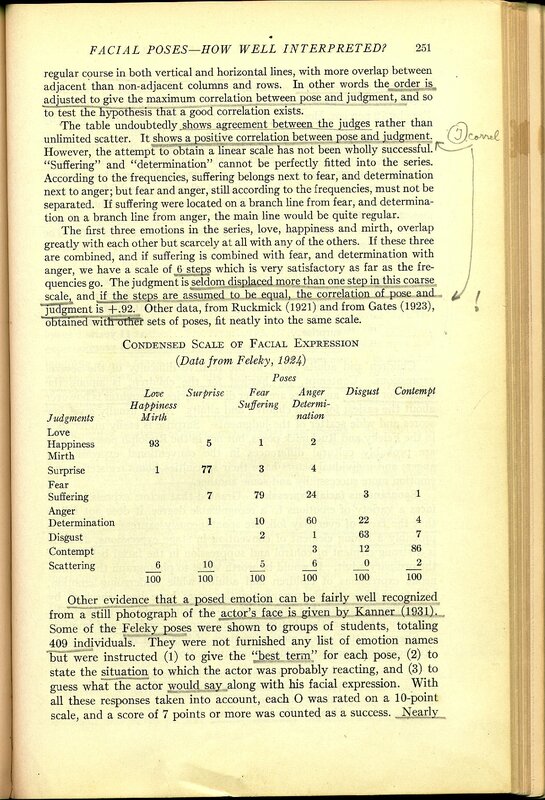 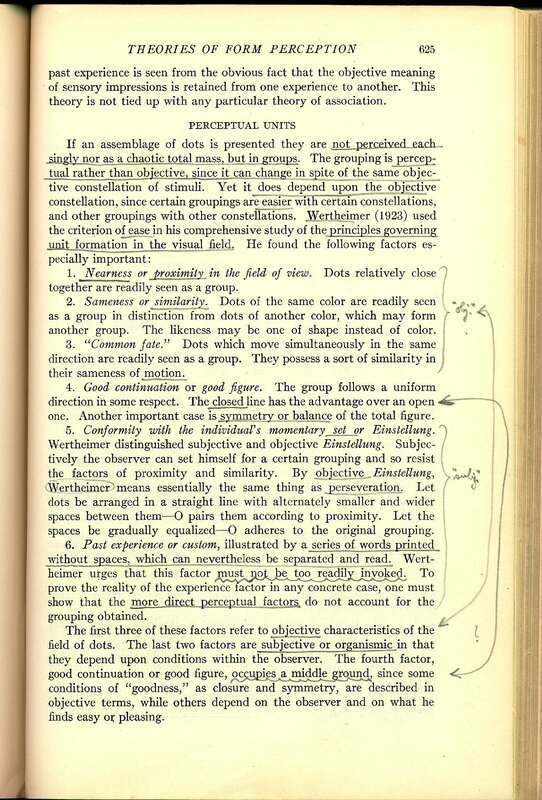 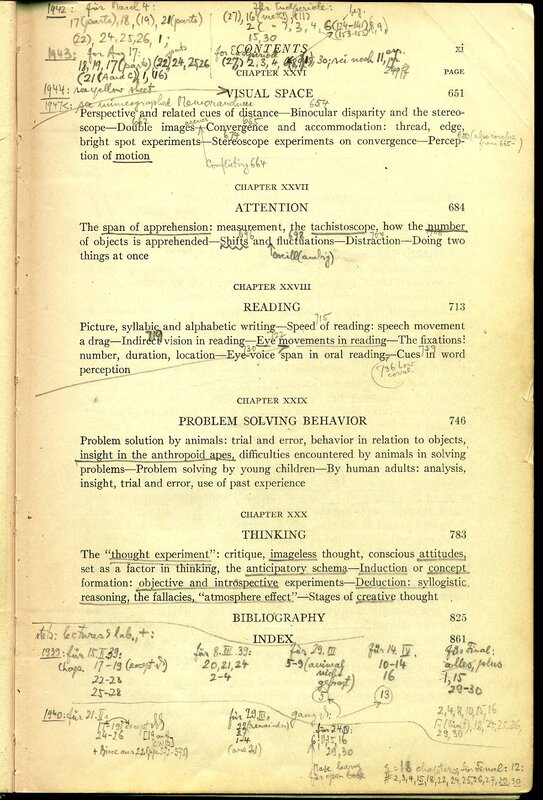 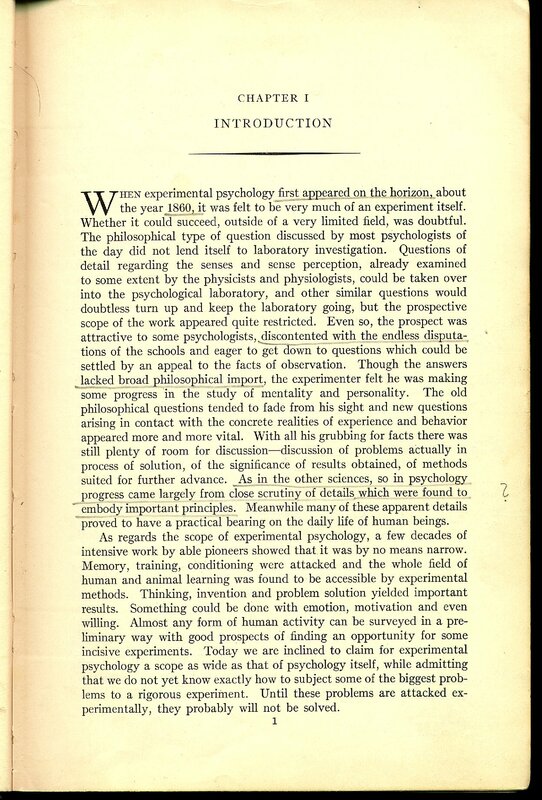 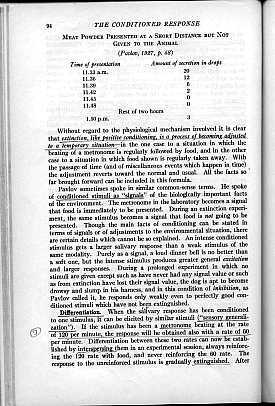 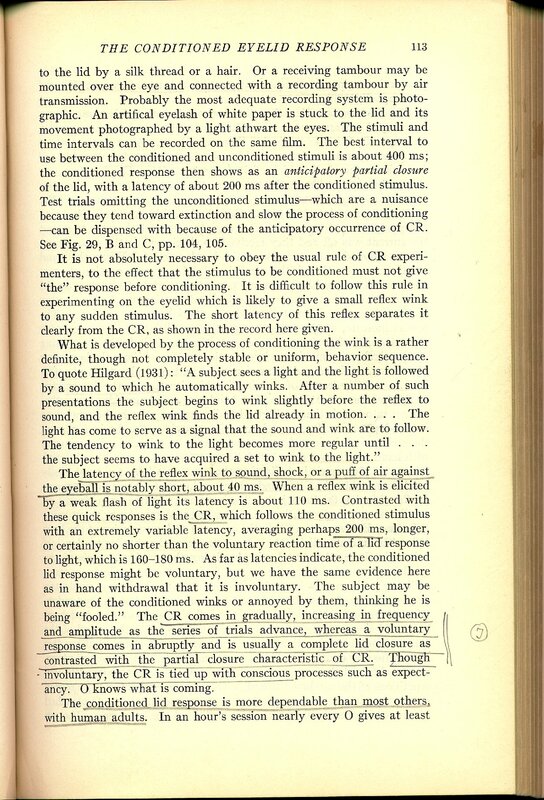 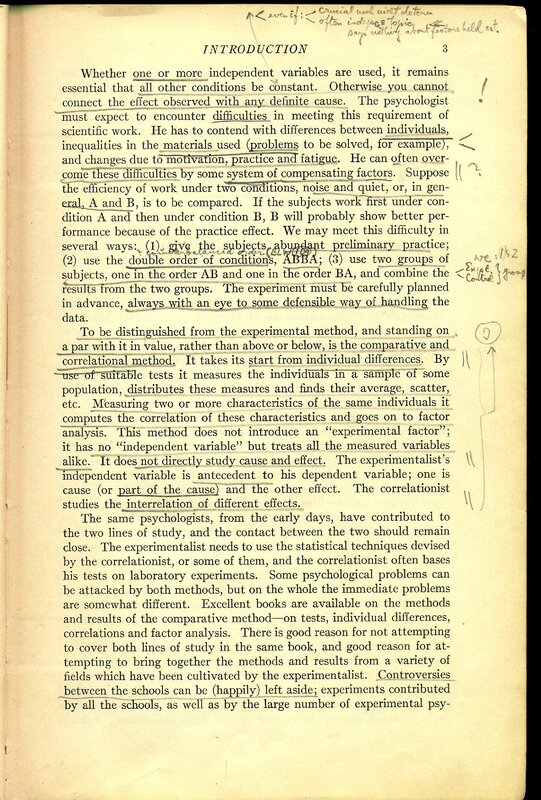 Woodworth's book, a text for thousands of psychology students, embodied the tradition of experimental psychology that Brunswik rejected. 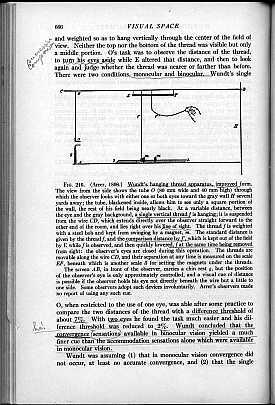 Brunswik taught from this book from its publication until his death. 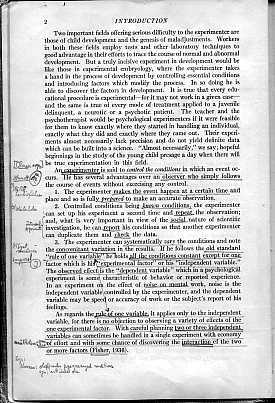 Donald T. Campbell was one of the TA's for the course in experimental psychology that was a premier requirement for all psychology majors at Berkeley (and, according to Ken Hammond, one that all the students hated). 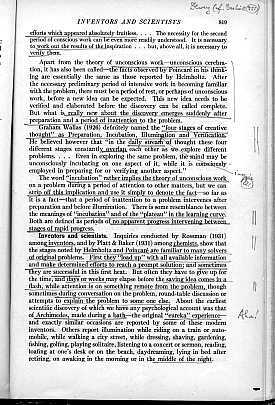 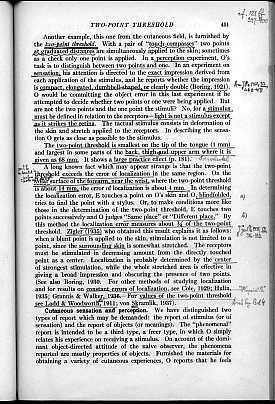 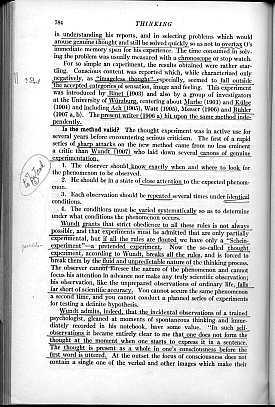 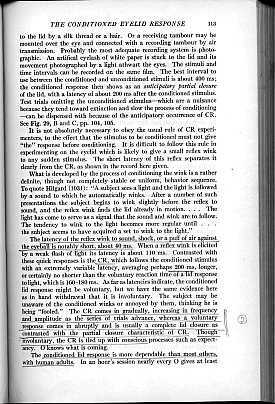 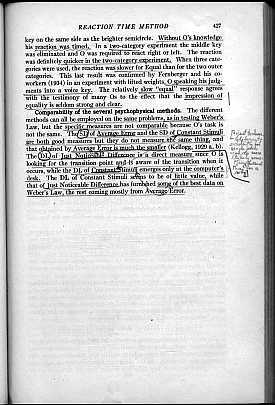 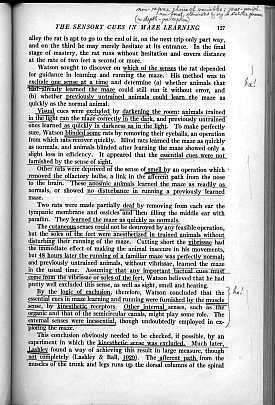 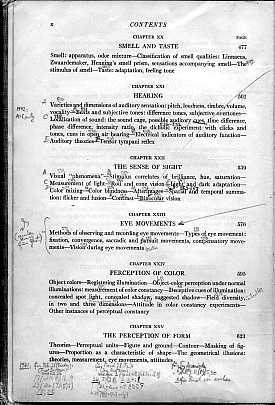 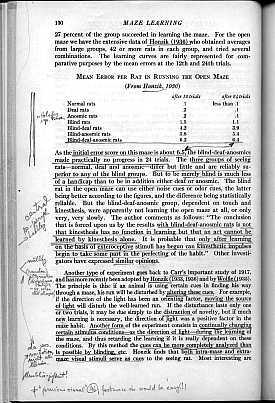 Brunswik underlined extensively and made comments in the margins on many pages. 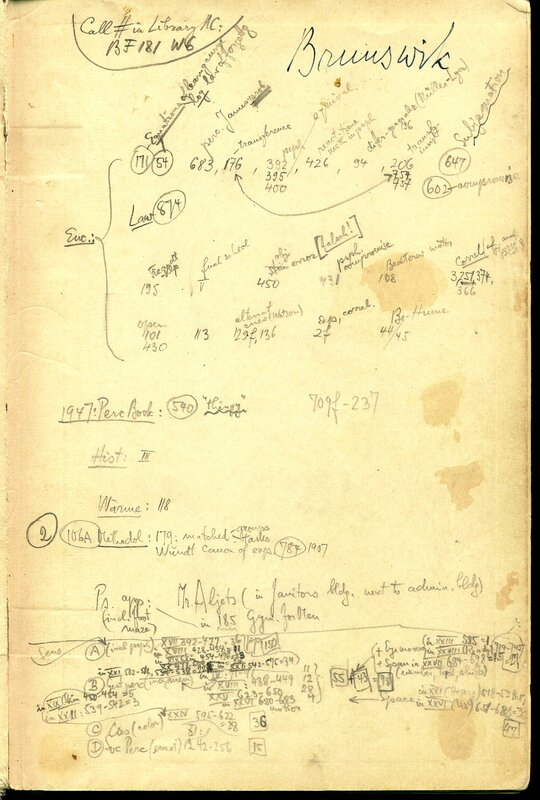 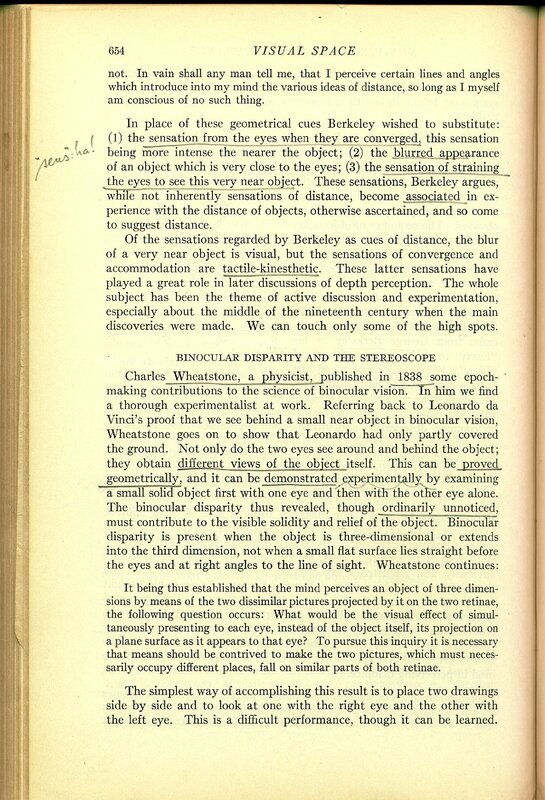 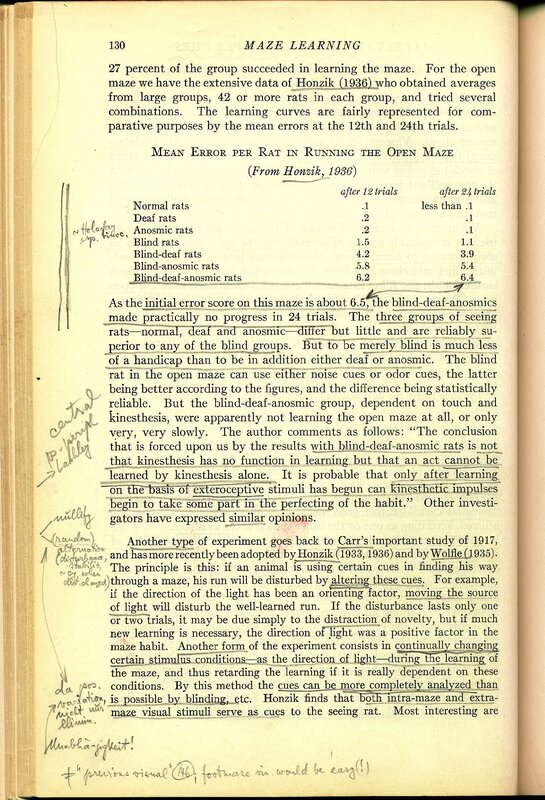 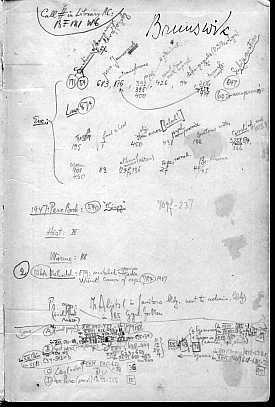 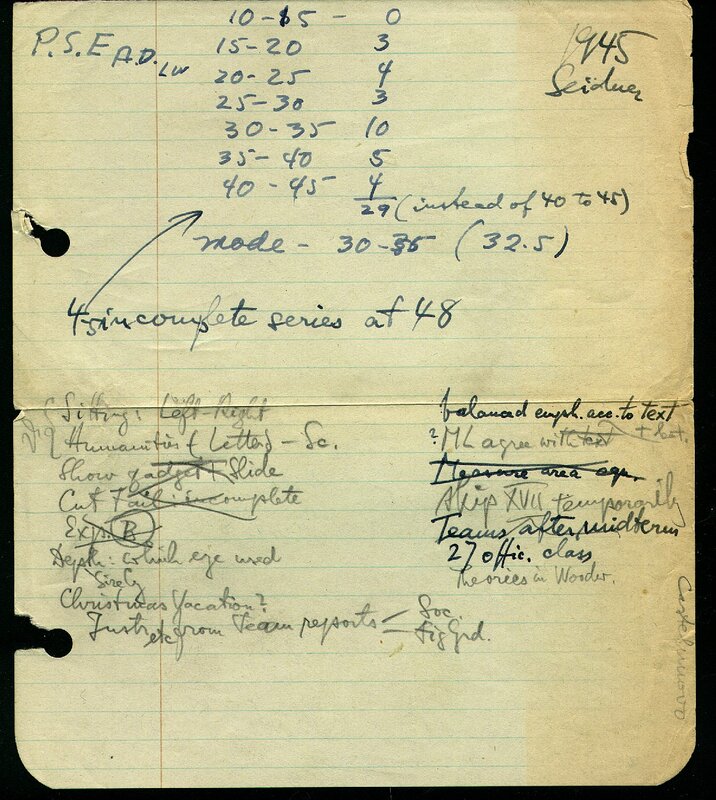 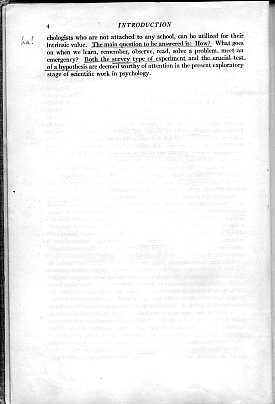 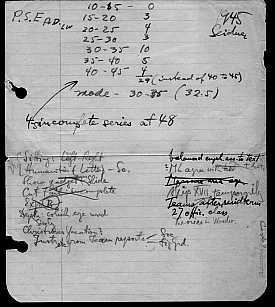 Scans of the page of Brunswik's notes facing the inside of the front cover, the table of contents, the introduction, and a selection of other pages are provided here. 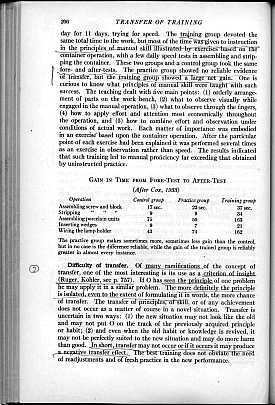 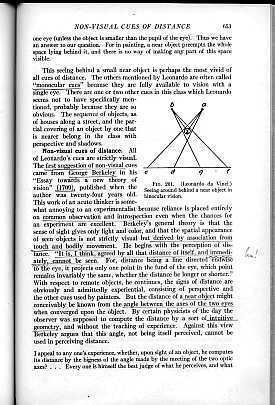 Click on the small black and white images below to view a large color image of the page. 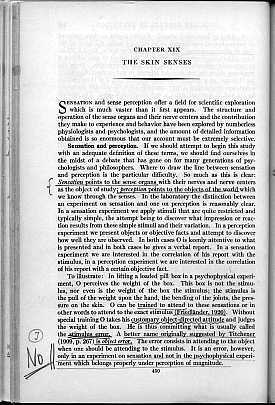 The large images are easily read on the screen. 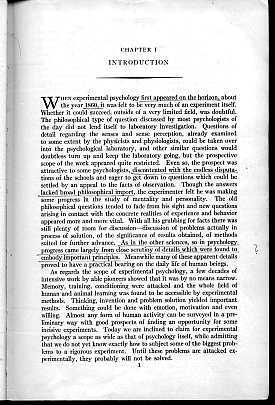 They can be printed at 200 dpi to make a reasonable copy that will be the same size as the orginal page (about 6.25 x 9.2 inches).